The flathead grey mullet (Mugil cephalus) is an important food fish species in the mullet family Mugilidae. It is found in coastal tropical and subtropical waters worldwide. Its length is typically 30 to 75 centimetres (12 to 30 in). It is known with numerous English names, including the flathead mullet, striped mullet (US, American Fisheries Society name), black mullet, bully mullet, common mullet, grey mullet, sea mullet and mullet, among others. The back of the fish is olive-green, sides are silvery and shade to white towards the belly. The fish may have six to seven distinctive lateral horizontal stripes. Lips are thin. The mullet has no lateral line. A common length is about 50 centimetres (20 in), and its maximum length is 100 centimetres (39 in). It can reach a maximum weight of eight kilograms (18 lb). The flathead mullet is cosmopolitan in coastal waters of the tropical, subtropical and temperate zones of all seas, as far north as the Bay of Biscay and Nova Scotia in the Atlantic Ocean. It occupies fresh, brackish and marine habitats in depths ranging between 0–120 metres (0–394 ft) and with temperatures between 8–24 °C (46–75 °F). In freshwaters of the western United States, the striped mullet historically ranged far up the Colorado River to the vicinity of Blythe and up the Gila River to perhaps Tacna. Because of the dams and restricted flows to the Gulf of California, the range in Arizona is restricted to the Colorado River below Laguna Dam and the lower end of the Gila River when there is water present. They are often abundant in the mainstream and lateral canals in the Gila River region. In the Colorado River mullet are pelagic in larger pools, sometimes moving into currents below dams, and generally occurring in small groups. The mullet populations are currently declining in Arizona, due to periods when the Colorado River does not reach the Gulf of California. The flathead grey mullet is an important food fish around the world, and it is both fished and farmed. The reported worldwide catches from fishing in 2012 were about 130,000 tonnes and aquaculture production was 142,000 tonnes. 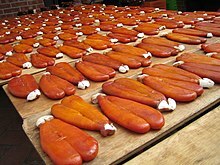 Drying mullet roe in Taiwan. The roe of this mullet is salted, dried, and compressed to make a specialty food across the world, such as Greek avgotaraho, Taiwanese Wuyutsu, Korean eoran, Japanese karasumi, Italian bottarga, Turkish Haviar and Egyptian batarekh. In Egypt, the fish itself is salted, dried, and pickled to make fesikh. On the coast of Northwest Florida and Alabama, this mullet, called the striped or black mullet, is often a specialty of seafood restaurants. Fried mullet is most popular, but smoked, baked, and canned mullet are also eaten. Local fishermen usually catch mullet in a castnet, though some use a hook. Mullet is a delicacy in this area and is most often consumed in the home. Mullet are usually filleted, and the remaining frames used for fish stock, used in chowders and stews. The mullet most commonly consumed in Florida however is the white mullet (Mugil curema), because its preference for cleaner water gives it a cleaner and less muddy taste. ^ a b c Camara, K.; Carpenter, K.E. ; Djiman, R.; et al. (2017). "Mugil cephalus". The IUCN Red List of Threatened Species. 2017: e.T135567A20682868. doi:10.2305/IUCN.UK.2017-3.RLTS.T135567A20682868.en. ^ a b c d e f Froese, Rainer and Pauly, Daniel, eds. (2014). "Mugil cephalus" in FishBase. April 2014 version. ^ a b c d Minckley, W.L. 1973. Fishes of Arizona. Arizona Game and Fish Department, Phoenix. pp. 257-258. ^ "FAO Fisheries & Aquaculture - Species Fact Sheets - Mugil cephalus (Linnaeus, 1758)". fao.org. Archived from the original on 2015-11-05. Retrieved 2016-04-30. ^ McKee, David (2008). Fishes of the Laguna Madre. College Station, Tx: Texas A&M University Press. p. 196. ISBN 978-1-60344-028-8.